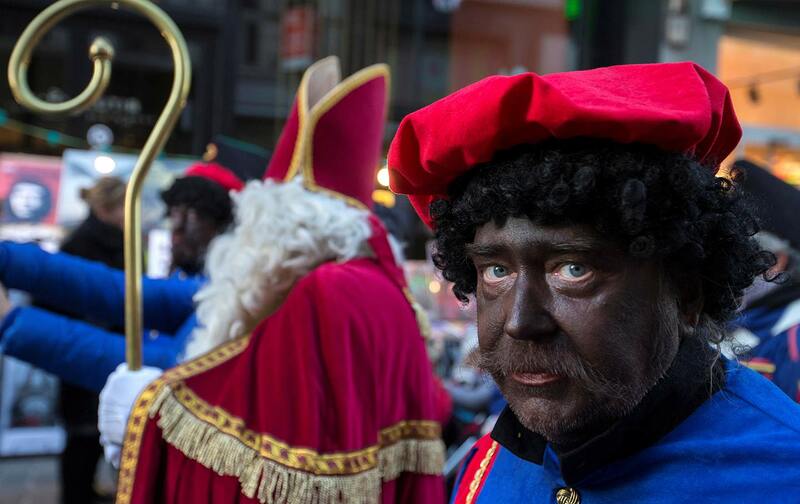 A debate over Zwarte Piet has exposed the deeply held Dutch belief that racism happens elsewhere. Often it is not the offending phenomenon itself but its defense that proves most revealing. Intent is claimed to be the sole measure of racism and, conveniently, intent is in the eye of the doer. In 2015, Dutch media professionals (overwhelmingly white) saw fit to print the n-word in the headline of a review of Ta-Nehisi Coates’s Between the World and Me and two other books. When The Washington Post’s Karen Attiah published a critical story, the NRC Handelsblad, a prestigious major daily, expressed muted regret about the headline’s effect on English-speaking readers but insisted nonetheless that the intended Dutch audience would not have been offended. Since the Netherlands fashioned itself as a progressive gidsland or “guide country” after the 1960s, with Amsterdam championed as “the world’s most liberal city,” racism is declared to be a distant relic of the past, or confined to such backwaters as the United States. “Race is done elsewhere—in the United States, in South Africa, in Britain—but not here,” the eminent Dutch scholar Gloria Wekker writes of the predominant Dutch worldview. White Innocence explains why white Dutch people seem unable to grasp the racism of Zwarte Piet: Assured of their own social progressivism, they can a priori think and therefore do no wrong. Having left its own historical involvement in European slavery and colonialism in the past—all too easily—the Netherlands claimed the mantle of a small but enlightened, internationally oriented nation-state after World War II. Through international institutions, human-rights organizations, and a liberal immigration policy, the Dutch believed themselves to have transcended racism. To raise claims about racism is taken as not only an affront to the accused but also an act of moral arrogance and cultural failure to assimilate on the part of the accuser. Wekker, who is professor emeritus of gender studies at Utrecht University, spent her career observing such behaviors and the psychocultural patterns of their rationalization. Born in the Surinamese capital of Paramaribo in 1950 and arriving in Amsterdam with her family in 1951, Wekker experienced the self-confident paternalism of the post-WWII welfare state and everyday racism firsthand. Before her doctoral training in anthropology at UCLA, she worked in what was in the 1980s called “ethnic minority affairs.” Both government policy and academic circles provided a wealth of personal experiences that she approaches here with cutting irony: white men assuming her to be service staff at professional conferences, for example. Case studies and vignettes, rather than historical narrative, serve as the book’s material for illuminating the Dutch white racial imaginary. Some examples are admittedly speculative, such as her reading of a 1917 psychoanalytic case study, in which five presumably white upper- or middle-class Dutch women complained of “Hottentot nymphae,” or enlarged labia minora. The psychoanalyst J.W.H. van Ophuijsen rejected his patients’ racialized self-accounts (which projected “hypersexuality” onto the supposed morphology of black women) in favor of a “masculinity complex.” Van Ophuijsen therefore subordinated the axis of race to the axis of gender, making the colonialist dimension of the women’s discourse invisible. This pattern, Wekker argues, is further evident in the limited headway made by postcolonial and intersectional theory in the Dutch academy: Even her own colleagues and students, she writes, expressed discomfort when issues of race were centered in the classroom. But it is above all white men whose self-righteous pontifications are eviscerated in White Innocence, and here the source material is abundant: Later chapters explore Zwarte Piet and the homonationalism of anti-Islam politician Pim Fortuyn, murdered in 2002, who liked to brag about his sexual escapades with Moroccan-Dutch young men. Today, Wilders insists that he is not a racist, despite his conviction last year for inciting racial discrimination against Moroccan-Dutch people after leading a chant supporting having “fewer, fewer” Moroccans in the Netherlands. It is a mistake, however, to attribute such attitudes solely to the right. In what philosopher Baukje Prins calls the politics of “new realism,” speaking freely, without regard for “political correctness,” is a sign of virtue, of egalitarian and characteristically Dutch bluntness. Humor and irony allow the speaker disavow racist utterances as mere jokes, to “have his cake and eat it too.” And it is indeed usually “he”: Confident in their enlightened virtue, “progressive” white men claim the right to be the arbiters of social-justice issues, especially in defending women’s rights and gay rights against supposedly intolerant, non-Western allochtonen, or those “originally from another country.” In practice, this bureaucratic euphemism means people of color, who are never quite considered echt Nederlands or real Dutch, even if born in the Netherlands; those who take issue with Zwarte Piet, for example, are told by their prime minister that if they don’t like it, they can leave. What lessons might those of us in that other “exceptional” country—the United States—take from the Dutch cultural archive excavated by Wekker? Mocking the racism of Zwarte Piet rings rather hollow in the age of Trump, whose triumph has hardly disabused the country of its claims to innocence. His election and the subsequent speed with which many US liberals called for an “open mind” toward his administration come as a shock to white people, but to many people of color they are sadly predictable. Worse still, some commentators have taken to blaming Hillary Clinton’s loss on “identity politics” and other social-justice “distractions,” betraying precisely the form of racial entitlement masked as “progressivism” that Wekker identifies. There is ample room on the left for disagreement about strategy and the causal overdetermination of the election results, but to subsume race (and gender) under the “real” issue of class does a grave disservice to those who are already the most vulnerable—including economically. Paraphrasing the title of Simon Schama’s celebrated cultural history of the anxieties of wealth in the Dutch Golden Age, Wekker concludes her work with a plea for “another ‘embarrassment of riches,’” for acknowledging the racism staring us in the face. In the United States, we might start by recognizing that there is, and always has been, no more audacious identity politics than white identity politics, as Trump and his white-supremacist ilk gleefully demonstrate. At least the illusion of innocence has been stripped away. Or perhaps not?